When I reviewed Asylum of the Daleks, I called Steven Moffat the master of the misdirection. Last night’s episode was less surprising than the season opener but no less satisfying. Turns out the Moff doesn’t need to manipulate your sense of direction in order to tug at your heartstrings. The Angels Take Manhattan contains nods towards thirties pulp fiction: the pre-credit sequence features a hard-boiled PI, Mike McShane pops up as a gangster with a taste for ceramics, we have brief glimpses of vintage cars and guns. 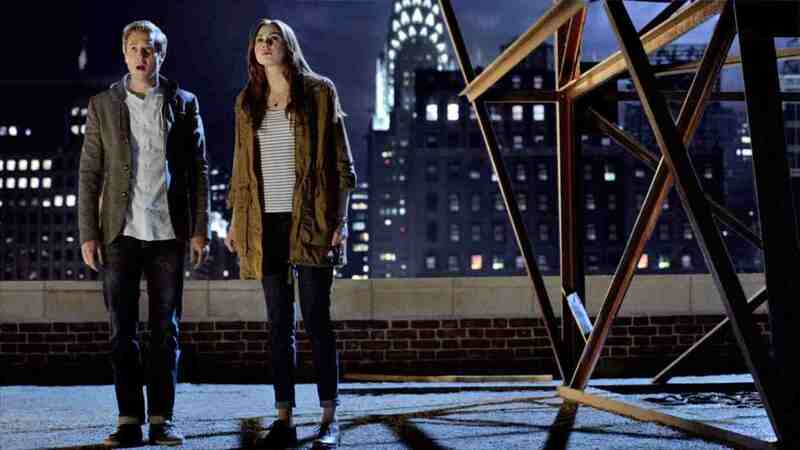 But Moffat can’t really be bothered with paying more than lip service to the genre – our hapless ‘tec hero never meets the main TARDIS crew and vanishes from the story with the cloudy title sequence; Mike McShane’s criminality is never explored: it’s unclear whether he’s a ceramic collector who’s stumbled into the nefarious world of Angel-dealing or a crime boss with a sideline in statues and vases. We never learn why River Song is in New York in a Fedora and trench coat, nor what becomes of McShane’s sinister gun-toting sidekick. This isn’t where Moffat’s interest lies. His choice of text isn’t Chandler’s “Down these main streets …” it’s Shakespeare’s “Then I defy you stars…”. The important pulp fiction artefact isn’t the crime or the investigator: it’s the book itself and the Doctor’s attempts to avoid playing out the events it describes. If he doesn’t sneak a look at the ending then he hopes he can avoid it. But his attempts are in vain: what’s written is fixed and the story ends as it required: with the sudden cessation of the Doctor’s travels with Amelia Pond. As I attempted to explore in last week’ review there was an initial freshness about the way the Eleventh Doctor’s companion was introduced and her story played out. Instead of an ordinary person with an easily identifiable background (single parent family on a council estate; student with parents having a mid-life crisis; suburban office temp repeatedly forced to live off the bank of mum and dad), we got a more fairy-tale (or Peter Pan and Wendy) approach. As I argued last week, the limitations of this approach have shown on occasion: Amy and Rory are less people to whom extraordinary things happen than extraordinary people to whom things happen. (“I’ll come back to life. I usually do!” cried Rory last night as he contemplated jumping off a skyscraper). But if the concept outlived its welcome that’s no criticism of the actors involved: Karen Gillan improved week by week to create a feisty, funny and fearless heroine. Arthur Darvill never gave less than a hundred per cent, excelling in deadpan delivery. The heart of the story is the finale where Amy never waivers in her conviction that she will be happier spending the rest of her life Doctor-less in one place with Rory than travelling for the rest of her life Rory-less with the Doctor. It’s a decision we applaud her for making and agree with her taking and as we do so we realise that this is a transformation in the character that’s happened before our eyes over the last couple of years. It’s a parting which belongs firmly in the tradition of post-revival Who – we’re reminded of Rose on the beach in Doomsday or Donna nattering about Pringles while the TARDIS engines rev up outside – but it doesn’t suffer in the comparison. The final sepia tinged still-frame of young Amelia Pond sets the seal on an era of Who which fans will remember for years with affection – not least for the unflaggable enthusiasm which Smith, Darvill and Gillan have shown for working with each other and for embracing the fandom which envelopes their work. I’m not sure we were left wanting more, but we were left with a feeling of satisfaction at a well-told final chapter. There are also some interesting developments in the show’s fearsome adversaries, the Weeping Angels – arguably, the best monster the show’s produced since the Daleks. Back to their old trick of zapping people around in time (on their last major outing they’d given up time-zapping in favour of strangulation), there’s far less emphasis in this story of the importance of not blinking in their vicinity. They seem to have acquired some sort of ability to mobilise statues rather than be mistaken for them (allowing for a couple of nice tricksy moments with the Statue of Liberty that lack any exposition) and to have acquired offspring in the form of chunky cherubs with a sinister giggle. The ability of the Daleks to evolve from static-electricity-dependent city dwellers to quarry invading intergalactic despots was crucial in ensuring their longevity in the series and the indications are that Moffat is similarly intent on promoting the angels from one-shot ponies to general purpose bad guys. We take for granted the snappiness and crackle of Moffat’s dialogue but we shouldn’t: it’s a genuine talent, and this script has its share of lovely moments – Rory’s haplessness when asked whether he’s noticed wrinkles around Amy’s eyes, the way a word like yowser becomes more significant as the story progresses, the zingy Doctor/River dialogue (but why no cry of “Geronimo!” from Amy and Rory as they leap to their depths to lighten the angst?). Armed with genuine NYC footage and some rather splendid stand-ins shot in Bristol and Cardiff, it’s confidently directed by Nick Hurran. The apogee lies in the graveyard scenes – shot in, of all places, Llanelli with a composite Manhattan skyline added by computer magic. As a standalone episode of Doctor Who it’s probably not the best. As a loving coda to the Pond era it’s hard to fault.